Lamba Techno Flooring is among one of the few companies to provide Joint Less Floors in India. 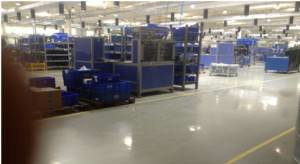 Joint less floor, Jointless Floor reduces maintenance cost. 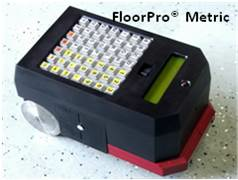 Joints are the biggest cause of problems for the floor user, Fewer joints =Less maintenance and higher MHE efficiency. By definition Jointless floors are floors constructed in large panels typically 50 m square without intermediate joints. The word ‘jointless’ can be misleading, as there is a practical upper limit to the area of concrete that can be placed in a single continuous operation. No joints are sawn, but steel fibres incorporated into the concrete mix control the width and distribution of cracks caused by shrinkage. A benefit of jointless floors to the building user is the opportunity of having relatively large areas of floor with no joints. Steel fibres were used in concrete to provide structural (load-bearing) capacity and for the control of shrinkage-induced cracking as against conventional Steel bars. 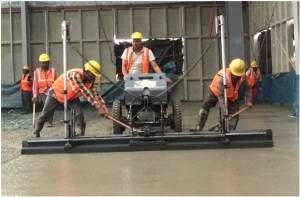 The ductile steel fibre floor with stands moderate deformations, minimizes curling of concrete slab. Easier and more accurate installation. 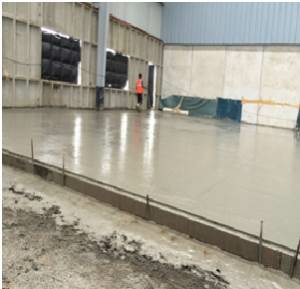 In ‘jointless’ slab construction, we used Steel fibres at dosages in the order of 30-45 Kg/m3. We have constructed north India’s first jointless floors for an area of 9000 m2 and panel size of 30X 24 M for M/s. Knorr Bremse of FM2 category as per international standards of TR-34. FM2 is a term used in defining high tolerance referring to surface regularity. Surface regularity needs to be limited in two ways. The floor should have an appropriate flatness in order to limit the bumpiness and general stability in operation of the materials handling equipment, and an appropriate levelness to ensure that the building as a whole with all its static and mobile equipment can function satisfactorily. There are essentially two methods for defining floor flatness requirements. Floors are divided into Free Movement Areas (FM) and Defined Movement Areas (DM). TR34 Classification FM2 is recommended when specifying a new floor as this represents a good quality floor that can be achieved without excessive cost. For VNA applications a DM Specification (Superflat floor) should be used and the category is defined by the racking height. 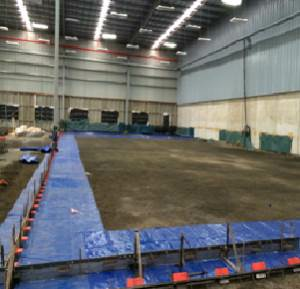 We at LTFSPL are proud to deliver Northen India’s First Jointless floor for an area of 9000 SQM for M/s. Knorr-Bremse India Pvt. Ltd. at Faridabad, with surface regularity confirming to FM-2 as Per TR34 Classification. FM 2 Flat Floor as per TR 34. We carried out a survey for Floor Level & Flatness by using Digital Profileograph “FloorPro” to ascertain whether the floor meets the requirements of International Standards of TR-34 & Survey report was submitted to assure our clients that we walk the talk. Lamba Techno Flooring Solutions is a name that has become synonymous with quality flooring solutions Delivering Faster-Flatter-Floors for Future! LTFSPL has developed a few special tools and techniques, it is essentially a question of attitude and commitment. Our company ensures that the project is planned well, managed effectively, resourced correctly and that workers are properly trained and supervised. With a full range of hi-tech equipment, experienced and qualified teams of professionals, we are able to provide fine tolerance floor as per international standards including TR-34, DIN 15-185 & ASTM 1155, meeting today’s Defined and Free Movement surface regularity requirements. With experience of laying more than 1 Million M2 of floor in last 4 years, we are here to deliver floors as per International standards. So when plan your next project you think of us as reliable business partner and not just another vendor.